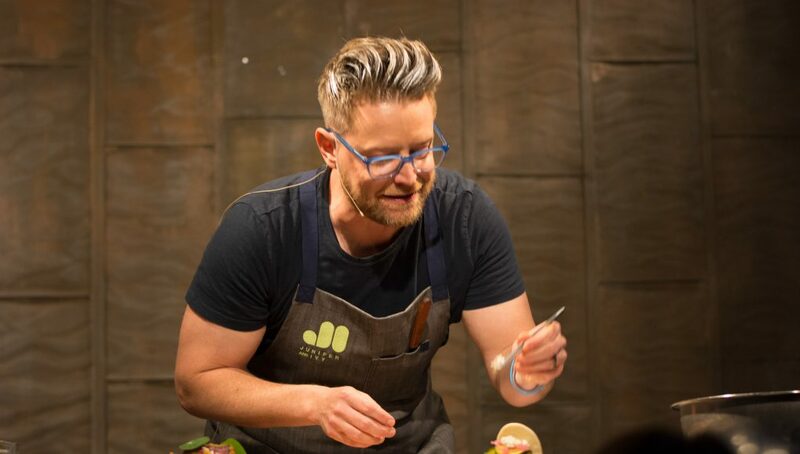 Chef, restauranteur, cookbook author and television personality Richard Blais was the latest Friend of Cooper’s Hawk to visit Chicago for an exclusive night of wining and dining. 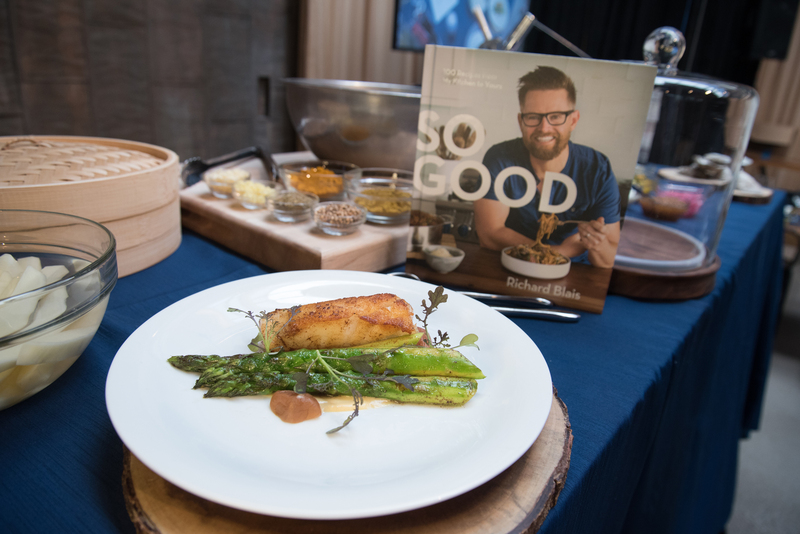 Guests ventured to Ovation in downtown Chicago where they enjoyed a night of culinary delights and wine by Cooper’s Hawk with Blais–notable for his recurring role on Bravo’s Top Chef, culinary company Trail Blais, and author of Try This at Home: Recipes from My Head to Your Plate. We kicked off the evening enjoying passed appetizers including the lobster roll, lamb belly steamed bun (the recipe is below!) and canned albacore paired with their Lux Sparkling. For dinner, we started with the first course of sea bass with miso mustard with a Riesling. The main entree was a delicious wagyu katsu paired with the Lux Meritage. We ended the night with butterscotch pudding for dessert among plenty of jokes from chef Richard Blais. Each guest received his latest cookbook, So Good. Why we love it? “It’s basically, what the Blais family cooks at home. Some dishes have been inspired by my restaurants, but a lot of it, is what I cook at home—spaghetti and meatballs, a steak dish, roast chicken, great salads, and desserts,” the chef told us backstage. To prepare the lamb belly, mix together the curry powder, turmeric, coriander, and cumin in a small pan. Toast the spices over low heat until fragrant, about 2 minutes. Remove from heat and transfer to a small mixing bowl. Add the soybean oil, garlic, and ginger and mix to form a paste. Rub the paste on the lamb. Set up a water bath to 82 C. Cryo-vac lamb belly in sous vide bags and sous vide at 82 C for 12 hours. Remove, reserve and strain liquid from the bag and cool completely under refrigeration. Meanwhile, reduce reserved liquid by 1/3 and use to glaze finished belly. Once the lamb is cooled, cut into 1-inch by 2-inch rectangles. Fry at 350 F for 1 minute, then toss in reduced lamb glaze. Serve Immediately. Sift together the flour, sugar and 1/4 tsp. salt in a large mixing bowl with the hook attachment. Dissolve the yeast and a pinch of salt in 1 tbsp. warm water, then add it to the flour with milk, oil, vinegar and 100 mL. water. Mix into a dough, adding a little extra water if needed. Place in a lightly oiled bowl, cover with a damp cloth and leave to rise for 2 hours, or until doubled in size. Tip the dough out onto a clean work surface and punch it down. Flatten the dough with your hands, then sprinkle over the baking powder and knead for 5 minutes. Roll out the dough into a long sausage shape, about 3 cm. thick, then cut into pieces that are about 3 cm. wide –you should have 18. In the palm of your hand, roll each piece of dough into a ball and leave to rest for 2-3 minutes. Use a rolling pin to roll out each ball, one by one, into an oval shape about 3-4 mm. thick. Rub the surface of the dough ovals with oil and brush a little oil over a chopstick. Place the oiled chopstick in the center of each oval. Fold the dough over the chopstick, then slowly pull the chopstick. Transfer the prepared buns to a baking tray lined with baking parchment, cover with a clean tea towel or lightly oiled cling film and leave to proof in a warm place for 1 hour 30 minutes, or until doubled in size. Heat a large steamer over a medium-high heat. Steam the buns for 8 minutes until puffed up (you’ll need to do this in batches). Serve while they are still warm.